Plants annual, glabrous. Stems prostrate or ascending (very rarely suberect), much-branched (usually from base), (0.1-)0.2-0.6(-1) m. Leaves: petiole ± 1/2 as long as blade; blade obovate, elliptic, or spatulate, 1-2(-4) × 0.5-1(-1.5) cm, base cuneate and tapering, margins usually entire, plane, rarely slightly undulate, apex obtuse, rounded, mucronulate. Inflorescences axillary glomerules, green. Bracts of pistillate flowers narrow, thin, 1.5-5 mm, ± equaling or slightly exceeding tepals. 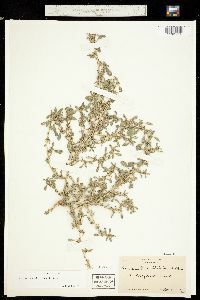 Pistillate flowers: tepals (3-)4-5, narrowly ovate to broadly linear, unequal or subequal, 1.5-3 mm, thin, apex acute or acuminate; style branches spreading; stigmas 3. Staminate flowers intermixed with pistillate; tepals 3(-4); stamens 3. Utricles broadly ovoid, 1.7-2.5 mm, equaling tepals, mostly smooth (slightly verrucose or rugose in dry plants), dehiscence regularly circumscissile. Seeds black, lenticular to broadly plumply lenticular, 1.3-1.6 mm diam., rather dull. Flowering summer-fall. Disturbed habitats: roadsides, riverbanks, railroads, fields, waste places, sandy flats; 0-2200 m; Alta., B.C., Man., Ont., Que., Sask. ; Ala., Alaska, Ariz., Ark., Calif., Colo., Conn., Del., D.C., Fla., Ga., Idaho, Ill., Ind., Iowa, Kans., Ky., La., Maine, Md., Mass., Mich., Minn., Mo., Mont., Nebr., Nev., N.H., N.J., N.Mex., N.Y., N.Dak., Ohio, Okla., Oreg., Pa., R.I., S.C., S.Dak., Tenn., Tex., Utah, Vt., Va., Wash., W.Va., Wis., Wyo. ; introduced and often completely naturalized in South America, Eurasia, and other regions. The name Amaranthus graecizans often has been misapplied to both A. blitoides and A. albus in older North American floras and manuals. Amaranthus blitoides was probably originally native to central and partly eastern United States, but now it is widely and successfully naturalized almost everywhere in temperate North America and in many subtropical to warm-temperate regions. It has not been reported from Mississippi or North Carolina but since it is found in all other conterminous United States it can be expected to occur in these two as well. Varieties have been described within Amaranthus blitoides; most of them are of no taxonomic significance, being mostly ecologic forms or local morphologic variants. Among the infraspecific taxa, the most constant is var. 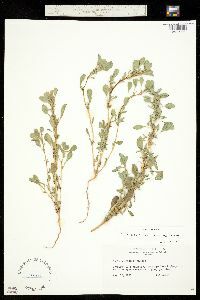 reverchonii Uline & W. L. Bray, with narrower, more elongated leaves. An infrequent to frequent weed throughout the state. It prefers a moist soil and is most frequently found on the muddy slopes of banks and gravelly bars of streams, in cultivated fields and waste places, and along roadsides and railroads. 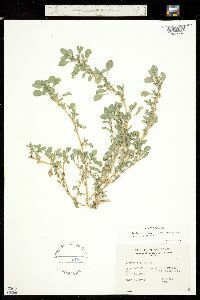 Duration: Annual Nativity: Native Lifeform: Forb/Herb General: Glabrous annual, prostrate or ascending, rarely suberect, stems much-branched from base, 2-6 dm long. Leaves: Alternate, petioled. Petiole half as long as blade. Blade obovate, elliptic or spatulate, 1-2 cm by 0.5-1 cm. Margins usually entire, base cuneate and tapering. Flowers: Inflorescences are axillary glomerules of green flowers; Staminate flowers intermixed with pistillate; bracts of pistillate flowers narrow, thin, 1.5-5 mm, more or less equaling or slightly exceeding tepals, with thin, narrow, long-tapering apices; pistillate flowers with 4-5 tepals, narrowly ovate to broadly linear, unequal or subequal, 1.5-3 mm, thin, apex acute or acuminate; style branches spreading; 3 stigmas; staminate flowers with 3 tepals, 3 stamens. Fruits: Broadly ovoid utricles, 2 mm, equaling tepals, mostly smooth, circumscissile dehiscence; seeds black, 1.5 mm in diameter. Ecology: Found in disturbed areas, roadsides, and waste places from 1,000-8,000 ft (305-2438 m); flowers April-October. Distribution: Originally native to the mid-west and eastern US, now widely naturalized. Found throughout the intermountain western United States and from Mexico to Canada. 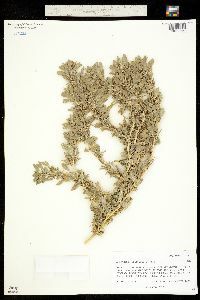 Notes: This species can be recognized by its prostrate, spreading growth form; oval-shaped leaves with entire margins (edges that are smooth and without lobes or teeth) which taper down to a slender petiole; and the small clusters of green flowers which grow only in the leaf axils and do not form inflorescences at the branch tips. 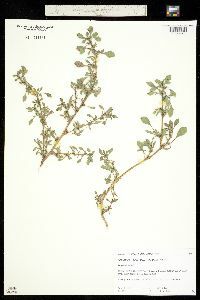 Stems are often but not always reddish in color and usually appear somewhat succulent. Ethnobotany: Young plants boiled and dried for winter food, the seeds were ground into a meal, eaten as greens and used as a potherb. As a forage it can be eaten when young, but all Amaranthus will cause bloat in cattle. Synonyms: Amaranthus graecizans Editor: SBuckley, 2010; AHazelton 2015 Etymology: Amaranthus comes from the Greek amarantos, "unfading," referring to the long-lasting flowers, while blitoides means it resembles blitum, an old name for strawberry blite, a coarse weed with a red fruit.